SCP-3961 in its inactive state. Special Containment Procedures: The University of Cincinnati College of Law main building is to be locked for the duration of 2400 to 0500 hours. Any student attempting to gain access to the building during these hours is to be turned away, and asked to come back during open hours. At 2400 each day, Foundation agents are to place an imitation of SCP-3961 on the dais it occupies. This imitation is to be removed at 0500 and placed in local secure storage. Any piece of writing modified by SCP-3961 is to be examined for anomalous content and then placed back in its original location. Any original writing produced by SCP-3961 is to be stored in the Site-19 library. Description: SCP-3961 is a bronze statue of the twenty-seventh president of the United States, William Howard Taft. 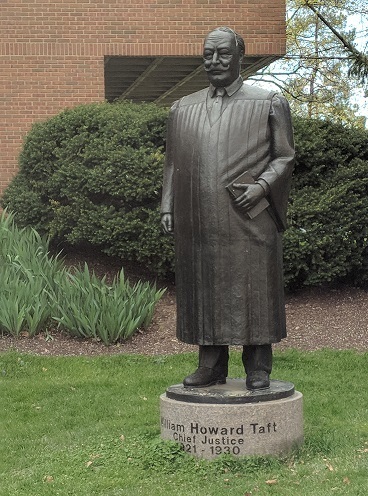 SCP-3961 is located in front of the University of Cincinnati College of Law building, and was placed there in 2007 to celebrate the 175th anniversary of the College, of which Taft was a graduate. From the hours of 2400 to 0500, SCP-3961 will animate and attempt to enter the College of Law building; the means through which it does so is unknown. If SCP-3961 is unable to gain access to the interior of the building, it will instantaneously de-materialize, reappearing within the Dean's office inside. Any attempt to remove SCP-3961 from its current location during its inactive hours will result in it de-materializing at 2400, and reappearing outside the College at 0500. During its active hours, SCP-3961 will patrol the interior of the building, occasionally stopping to write. If SCP-3961 encounters any piece of student writing, it will produce a bronze pen and provide feedback on the work. SCP-3961 is capable of learning, and actively seeks out information on world affairs and legal proceedings. Should SCP-3961 encounter a human during its active state, it will attempt to greet them with a series of hand gestures; SCP-3961 is believed to be unable to vocalize. Any individual that expresses a need or desire for information pertaining to law will be escorted to the College library, where SCP-3961 will assist them with locating any related books or materials. Once a year, on April 28th, SCP-3961 will leave a collection of papers on the desk of the current College Dean1. These papers will list all law students expected to graduate that year, and include encouraging personal statements for each student. 2400: SCP-3961 animates, and enters the building through the front door, holding the door open for waiting Foundation agents, who lock it behind them. 2400-0100: SCP-3961 wanders the hallways, stopping to examine portraits of William Howard Taft, occasionally making dismissive gestures at particular instances. 0100-0300: SCP-3961 spends several hours writing out a series of lectures titled "Beyond the White House: President Taft as Chief Justice", in which it discusses Taft's tenure as Chief Justice of the Supreme Court. Written content is noticeably more emotionally-charged than SCP-3961's usual writings. 0300: SCP-3961 reads from multiple books on American history. 0400: SCP-3961 attempts to photo-copy several papers, but expresses visible frustration with the copy-machine. Agent Baker assists SCP-3961 with making the copies, after which he is given a gentle pat on the back. 0500: SCP-3961 exits the building and approaches its dais. Agents remove the imitation statue, and SCP-3961 takes its place. Before SCP-3961 enters its inactive state, it makes a slight bowing gesture towards the agents. Addendum: On September 15, 20102, SCP-3961 deviated from its normal routine and attempted to enter the nearest campus mess hall. After being let in by Agents Baker and Pastor it proceeded to gather a series of ingredients, which it used to bake a small chocolate cake. Upon finishing, SCP-3961 cut the cake in half, giving each agent a piece. When Agent Baker attempted to give SCP-3961 a portion, it made several 'refusal' hand gestures before pointing to its stomach. SCP-3961 now repeats this behavior annually.